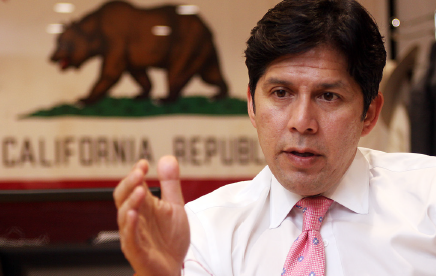 Former State Sen. Kevin de Leon announced Feb. 11 that he is running in 2020 for the Los Angeles City Council seat being vacated by Jose Huizar. De Leon, 52, represented Downtown and the Eastside in the Legislature, from 2006 to 2010 in the Assembly (45th District) and from 2010 to 2018 in the Senate (Districts 22 and 24), where he served as president pro tempore from October 2014 to March 2018. He unsuccessfully ran for the U.S. Senate seat of fellow Democrat Dianne Feinstein last November. Earlier this year he became a policymaker-in-residence and senior analyst at the UCLA Luskin School of Public Affairs. De Leon, who pledged to “continue on a path of public service, to focus on building coalitions in our communities to achieve our common goals,” is the most prominent politician to declare his candidacy for the council seat that represents District 14, which includes Eagle Rock, Boyle Heights, El Sereno and Downtown, including Little Tokyo. His endorsers include current council members Curren Price, Paul Krekorian and Mitch O’Farrell. Huizar was first elected in 2005, was re-elected in 2007, 2011 and 2015, and is now termed out. His wife, Richelle Huizar, announced last year that she was running for his seat, but withdrew from the race after the FBI raided her husband’s offices and their home as part of an FBI corruption probe focusing on huge real estate investments from Chinese companies. Investigators are also seeking information related to several City Hall figures, including former Deputy Mayor Ray Chan, Price, former Board of Public Works member Joel Jacinto, and current or former aides to Huizar, Council President Herb Wesson, and Mayor Eric Garcetti. No one has been arrested or charged in the investigation.